Home Lifestyle Burritos! Bagels! Buns! Last Sunday was the last Lulu’s pop-up brunch for the forseeable future. They’re going on a bit of a pop-up hiatus (although I hear there may be one more pizza pop-up in the near future). So of course my brunch friends and I had to go to this last one. It had a Mexican theme with nachos, tacos, and burritos. But most everyone at the table (except for Anthony) ordered the Breakfast Burritos because you got two! These were stuffed with tofu scramble, cumin roasted potatoes, and blackeyed pea chorizo and topped with red sauce and cashew queso. Lulu’s will still be at the Cooper-Young Farmer’s Market most weeks though, and they’re expanding to the downtown market too! Last Saturday, I stopped by the CY Market and got one of their Smoked Carrot Bacon & Cashew Cheddar Buns to eat for breakfast on Sunday. My fave! Speaking of Lulu’s, I used some of the Cashew Coffee Cream Cheese I bought last week to top these Almond Butter Banana Pancakes (from The No Meat Athlete Cookbook). I made the pancakes a couple weekends back and froze the leftovers. They made an excellent breakfast on Friday morning with the cream cheese. 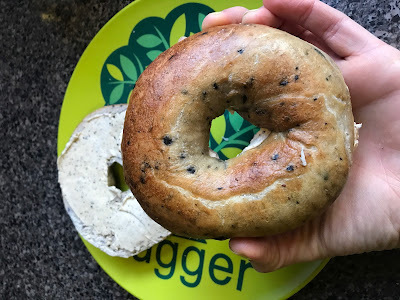 I also spread some of that cream cheese on these Blueberry Bagels from Dave’s Bagels (also from the CY Market) before my Saturday long run of 18 miles. Nothing powers me through a long run like a white bread bagel! They stay with me longer and don’t cause digestive issues. Last bagel pic/last of the cream cheese. 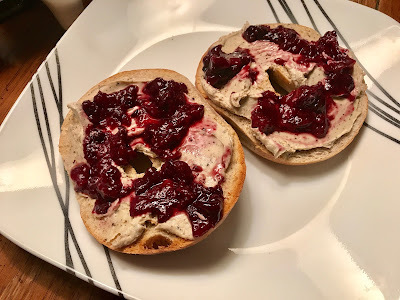 For Monday’s breakfast, I had a Dave’s Whole Wheat Bagel with Cashew Coffee Cream Cheese and Mixed Berry Jam. I made the jam on the stovetop by cooking down a half-cup of frozen mixed berries with a tad bit of water and a teaspoon of agave. Yum!